Our tally: 140 comments received, 139 against the initial designs, 1 for, and 95 commentors who gave us specific permission to publish their comment. You can search our database by name, by tag, or read the comments in bulk by downloading the pdf. Bridget: Last summer, my children were almost hit by a car turning from Weaver onto Merrimon (heading north)…Beyond the issue of safety, I can guarantee that many of the errands I run on Merrimon Ave would be done on foot or bike if I felt safe to do so. We do not need another Hendersonville Rd, or New Leicester Hwy. We need a neighborhood road where the thousands of residents in this area can safely walk or ride their bikes. So many of your comments were not about bikes – instead they were about people and about safely moving around our City. Asheville on Bikes knows where you are coming from! Does NCDOT? Martha: Your proposal also ignores the recommendations of hard work by the people of this community who have proposed visions that do take into consideration all of the modes of movement that make a city inhabitable and safe… Walking to nearby businesses is a scary and difficult task but I attempt it. We need a renovation that addresses that problem not make it worse. There are so many more comments, many of which call for both a different design and different behavior from NCDOT. Dan: I am appalled at the complete disregard shown to the residents of Asheville by NCDOT… the current course of action actively ignores existing policies, standards and proposals concerning urban transportation, both locally and State wide. The current NCDOT plan is a huge step backwards in transportation thinking. Thank you for sharing your comments with us so that we can work together for a better future! 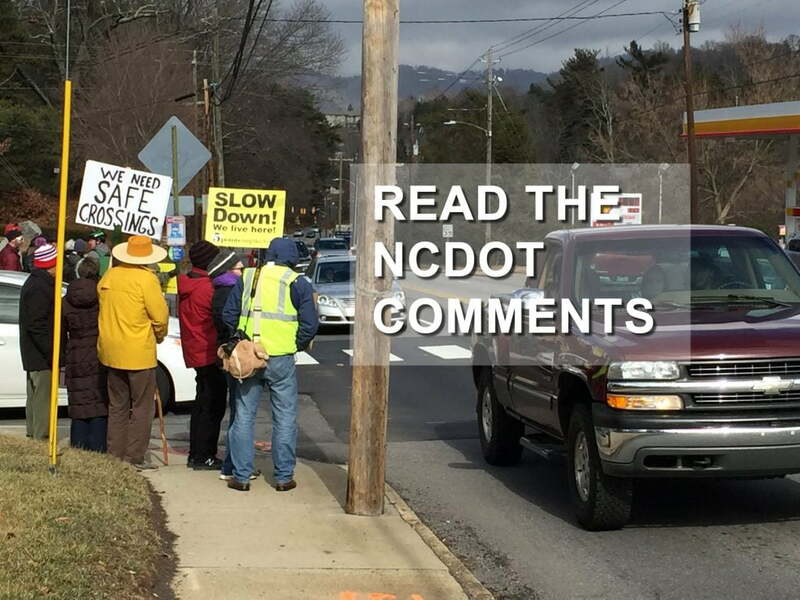 Public comment database: Read what your neighbors wrote to NCDOT; full text of 95 comments.